Looks like the end of summer was a very solid showing... like clockwork, as you said, those dependable dividends keep rolling in. Looks like you anticipate a strong finish to 2017 with your Sep. and Oct. totals coming in pretty high. We share a lot of names for August too! Keep it up! Hey it looks like we have some of the same companies paying us dividends. It looks like your portfolio is producing very nicely. It is growing into a nice snowball. Keep up the good work. Solid total for August, YD... and that's an impressive collection of dividend payers. With what you estimate for Sept. & Oct. your quarterly average will keep moving up and to the right - just what you planned. Glad to see there are 5 stocks we share (PG, O, SBUX, APD, HRL). Keep those updates coming. Heck yah, what a massive divvy from AT&T - reinvesting that back into them at 5%+ is awesome too. Love the trend, as well, that the moving average is heading for you, you are killing it that's for damn sure, looking at around $800 on average almost eh? Also - nice compounded dividend impact you have there with the yield + growth rate. 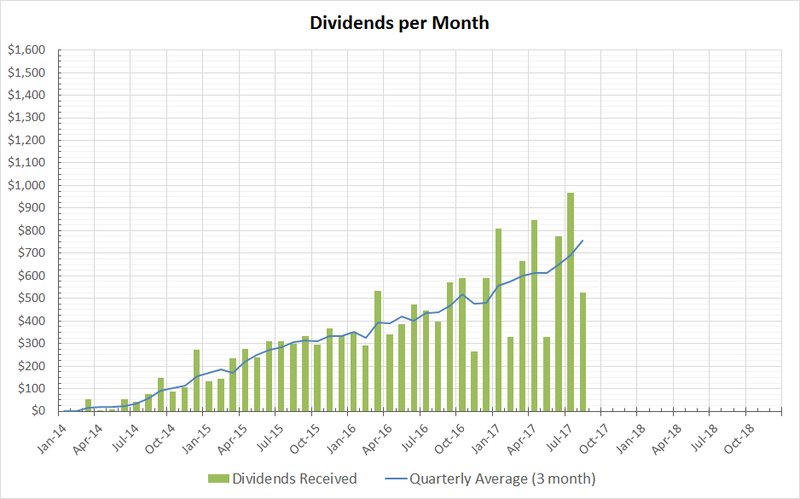 Over the last year, my weighted average growth rate has decreased by about a percent due to lower growth rates on the dividends, to about 5% or so; therefore, my impact is over 8% (yield + growth) and has swayed away from my ~10%. Keep it up. Hey YD, I just ran my filters for my sept buy thru David Fish. My hopes were between T and KMB but the payout ratio for T is 92.02. What do you think of that payout ratio? Makes me nervous although the divy looks awfully nice. My two choices just looking at my filters are between ADM and KMB with ADM fitting all my requirements and looks pretty good. What is your opinion of ADM? What are your thoughts on KMB now vs when you purchased? I prefer KMB over T. More conservative industry and the payout ratio is less risky. I don't worry that AT&T will have issues with the dividend. Their debt is something I am more worried about especially after the Time Warner acquisition. I prefer KMB's business over ADM's. I don't like the type of business ADM is in. However ADM is very high quality and if you're comfortable with the more cyclical nature (more commodity-like) of its business then I have no qualms over owning it.